Erica, is another of our faces from our January Flexible Fitness Membership Campaign. Her story was really popular, resonating with many of you and inspiring you to take up a Fitness membership package and start your journey to a healthier, happier you. Having lost over 8 stone, Erica had also stopped smoking and drinking and managed to come off oxygen, which had been helping her to breathe for a long time. With all these changes, Erica became so much fitter and healthier and had returned to work as a cleaner at Queens Medical Centre, which meant she was on her feet much of the day. It’s been 6 months now and we thought we’d catch up with Erica again to see what’s happening in her life and how she’s feeling. 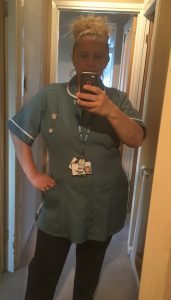 “Losing weight and getting fitter motivated me to change my career and aim to do something I’ve always wanted and last month I achieved it, starting my new job as an auxiliary nurse at the Queens Medical Centre. I’ll miss the Rapid Response team but I’m looking forward to a new challenge and I’m sure I’ll still see my old colleagues regularly. I’ve recently completed four intense weeks of training for my new role, which were really full on and meant that I wasn’t able to get to classes and swimming at Clifton Leisure Centre as often as I did before, but I still managed to take some time to exercise as I know how much it helps me relax during busy or stressful times in my life. My hubby and I have just got back from a wonderful holiday in Greece which I have to admit has been “diet free” so I have gained a few pounds, but I know I need to re-focus and get back on both my healthy eating and exercise regime and have already booked 10 different classes already, starting Friday. I’m aiming for those few extra pounds to be gone before I take part in this year’s Pretty Muddy Race for Life, in September as an Active Nottingham Muddy Maiden with 199 other leisure Centre customers and staff. There’s still places if you’d like to join me? If, like Erica, you want to make a change, whether it’s losing weight or just leading a healthier lifestyle, why not sign up to Flexible Fitness today?